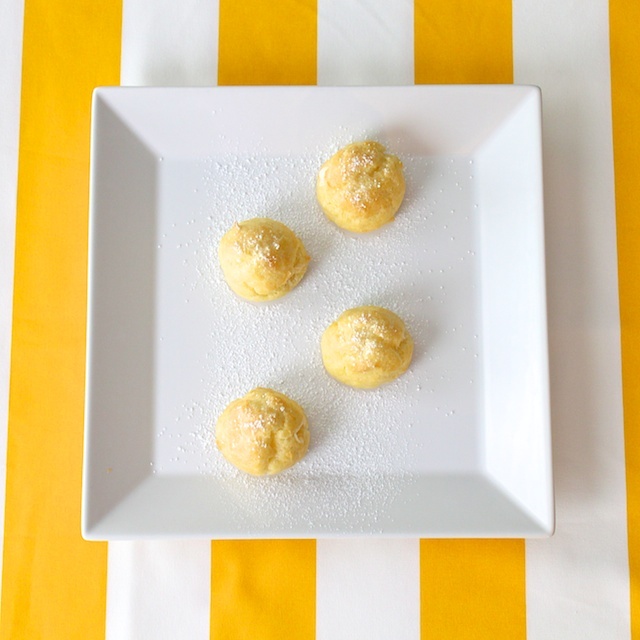 Everyone asks for my homemade cream puffs recipe. Little do they know that it’s super easy. But I’m afraid that if I hand out my cream puffs recipe then people would stop inviting us over. Please don’t stop being our friend now that I’m giving out this recipe. I am a lover of cream puffs. The thing I don’t like about the store bought kind is the greasy texture of the cream. But I’ll still eat them if they are around. Let’s just say I have never said no to cream puffs before. This recipe, the cream is creamy and not greasy. It’s the best cream puffs you will ever eat. Make the cream filling first by mixing vanilla pudding, milk and whipped topping in a bowl. Cover and refrigerate while you make the puffs. Then bring butter and water to a boil in a saucepan. Then dump all at once into the boiling water and butter. Cook, stirring vigorously until the mixture forms into a ball. Remove from heat. Add eggs one at a time, beating until smooth after each addition. Using a mellon scooper, place a scoop of the dough on a greased cookie sheet about 2 inches apart. Bake for 15-20 minutes or until golden brown. Allow to cool for 5-10 minutes before putting the cream into the puffs. I use a frosting tip to squirt the cream into the puffs. It’s best to eat the cream puffs when cold, so refrigerate again. When it’s time to serve, garnish with powdered sugar. 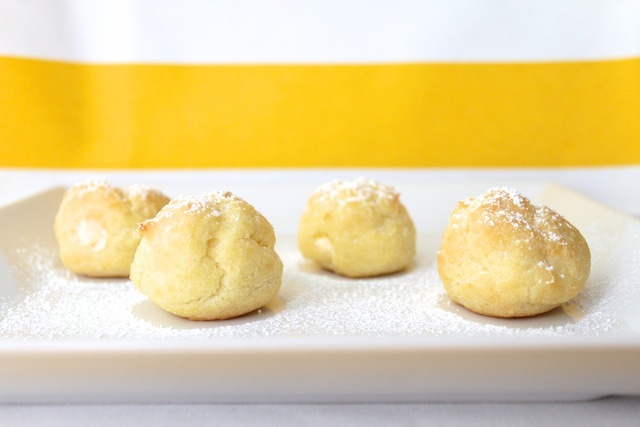 » Tell me… Are you a cream puff fan? What do you like to take to parties or other people’s homes? Cream Puffs are one of my favorites too, they’re super easy and only as sweet as you make them, YUM! If you love them you might also really like my very favorite dessert which is baguette bread slices with fresh fruit, raspberries for me, and whipped cream, and for extra sweet yummy flavor you can spread Nutella on the bread first. SOOOOO YUMMY!!! I am a HUGE cream puff fan, being an aussie, I am also partial to pavlova. I feel the same about sharing recipes for certain things but I also feel as though I don’t want to be know as a “one trick pony”. People always ‘request’ my pavlova when I come visit…maybe now they will request cream puffs if I get an opportunity to make them this summer. A melon scooper! Genius! I’m going to have to get one now. Thanks! I LOVE THIS RECIPE I also loved making it with my kids . i cant wait to make them again!! This does look super easy. Yum! Can’t wait to try them! This looks so easy and yummy! I don’t think I’ve ever had home made cream puffs before! I’m definitely trying this recipe out. One question – is it whipped topping or whipping cream? The ingredients and the instructions say different things. Thanks for sharing! whipped topping. thanks for pointing that out. i fixed it. So is it whipped topping or whipping cream? you can come over to my house (with the puffs, of course) anytime! Love CREAM PUFFS! Actually, I just wrote a post on them last week….my mom makes them with chocolate on top. YUM! You’re are so pretty! Wow – those look amazing! One of my all time favorite desserts!! Thanks Tiffany! I’ll still be your friend – you can come over anytime you’re in Maryland! 🙂 Hmm, I could so do these with chocolate cream. Yumm… And I agree. The store bought kind just don’t cut it. Can’t wait to try these out! of course! whipped topping… here in the u.s. (i’m not sure of other countries) you can purchase whipped topping in a container usually in the freezer department of the grocery store. however, you can make your own. whipping cream (the liquid stuff you buy near the milk) and a tablespoon or 2 of sugar. put it in a mixing bowl and beat with a mixer until it is a thick, fluffy consistency. hope that helps! 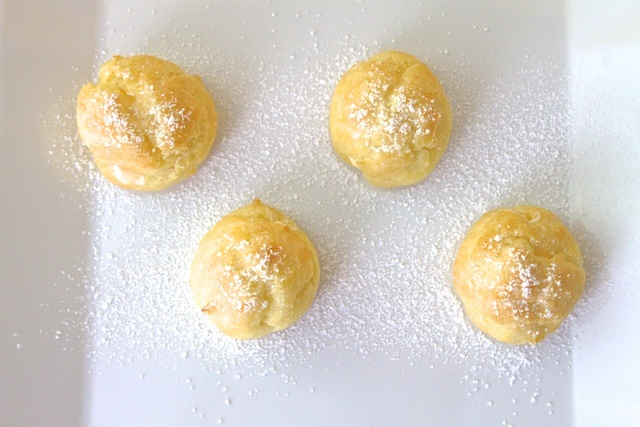 Cream puffs are one of my all-time favorite desserts! I featured your recipe here! YUM! what am i doing wrong ? as soon as i take them out of the oven they go flat. they r nice and puffy in the oven ? maybe you are making them too big? sometime they do go flat a little after it has been taken out of the oven but if you quickly fill it with the cream you should be fine. When I made my cream puffs they came out hard and I threw them away. I thought I did something wrong. Now I want to try again. Are they suspose to be hard when they come out of the oven? no. they shouldn’t be hard. OMG! I’m just a kid looking for recipes and that sounds(and looks) sooooo good!!! Thank you for the recipe! I LOVE cream puffs! How many puffs does this recipe yield?? Thanks!! Can’t wait to make them this week! It made about 24 for me. I had to use my mini ice cream scoop because I don’t own a melon baller. I made these today. I’ve never had a cream puff, so I don’t have anything to compare them to. I think they have a strong egg flavor. Perhaps all cream puffs do, but it’s a little more than I care for. If I made them again, I’d only use 3 eggs, just to see if it would taste better. Hi, I made these just now..they came out PERFECT. Thank you so much for sharing this yummy recipe. Wish i could post the pic here..
How big can I make these cream puffs? Can you tell me what size melon scoop you use for these? They look and sound great.